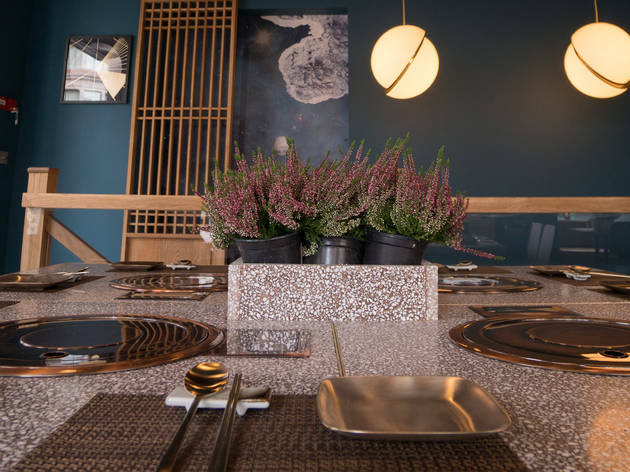 A Korean barbecue restaurant on Shaftesbury Avenue. 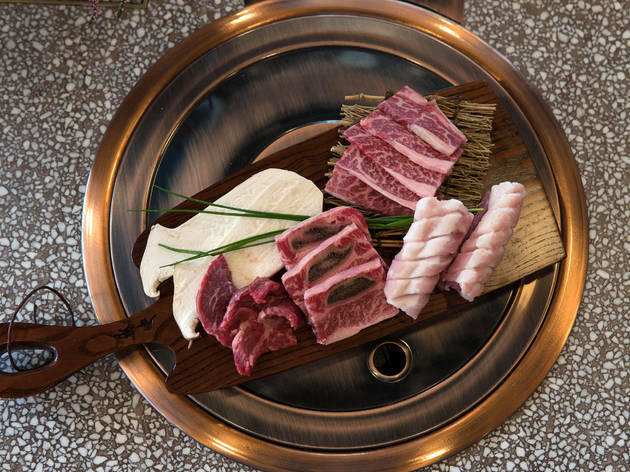 Don’t be fooled by the dull decor and hotel lounge muzak: this Korean barbecue restaurant is the real deal. Set in a deceptively small space on Shaftesbury Avenue, when the food is this good the uninspiring setting actually makes the whole experience more charming. You’ll feel like you’ve stumbled across a hidden gem. You have. 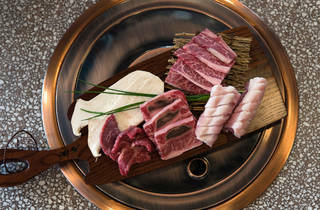 Chief of Olle’s charms is that its meat is cooked in traditional Korean style, on a grill built into your dining table. K-BBQ virgins, don’t panic – Olle’s helpful and welcoming staff do the actual barbecuing, leaving you free to sit back and enjoy the show. Everything was cooked to perfection, but the absolute highlight was the bulgogi: literally ‘fire meat’. The tender, caramelised beef was so good, I ate it straight off the grill with chopsticks. Surprisingly, the non-barbecued starters were even better. 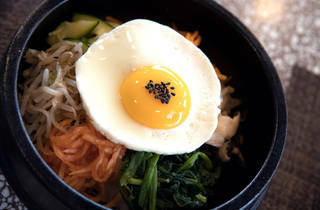 Best of all was a classic yukhoe (Korea’s answer to steak tartare). Banish all thoughts of the French stuff you order in fancy restaurants. Olle’s was served in the traditional style: sweet, mellow and infused with sesame and fresh pear. Also fantastic was a seafood pajeon, a delicious savoury pancake cut through with spring onion and chilli. 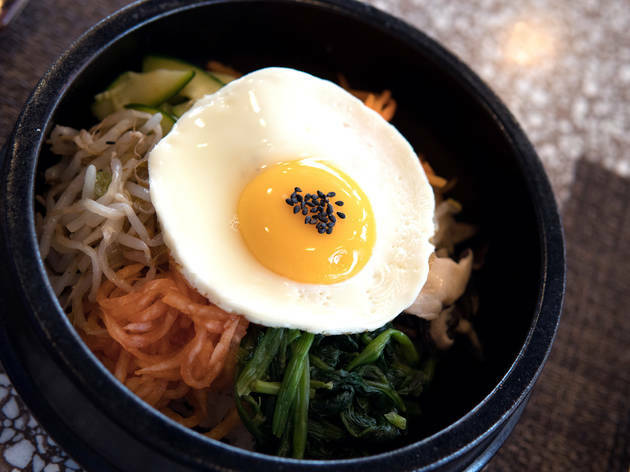 Not every dish was perfect – a bibimbap (Korean mixed rice) was disappointingly bland and the prices here are relatively high for a restaurant so lacking in atmosphere. But the quality of those starters more than makes up for it. If you’re on Shaftesbury Avenue you can’t do better. Go – and make your own fun. So due to it's prime location there is usually a queue to get in so it would be worth booking/putting your name down. However, once you enter the places is deceptively large as they have some additional space in the basement. 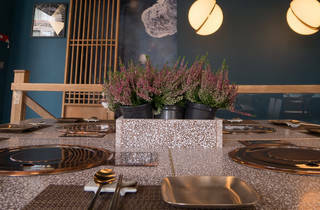 All tables come with Korean BBQ's, however, you need to order at least 2 items from the BBQ menu for them to fire it up. Therefore we didn't end up ordering the BBQ items as we wanted to try some more stuff off the menu. The food is nice - but not amazing. My favourite dish was the Korean chicken wings which were coated in this tasty(and spicy) Korean sauce. And topped off with a glass of plum wine. As for the service, I think despite them not being overly busy, the lady first didn't submit our whole order so we waited for 30-45 mins before she realised. And then when the order was submitted, she missed items from the order. All in all not a great service, however i feel like she was just having a bad day. Olle - a decent restaurant but not something I'd shout about. Save yourself and go to Xu around the corner. This place isn't too bad, but is quite expensive. Our waitress was super friendly and helpful, definitely making a difference to the experience. They help you cook the meat if you want, so you can just sit back and nom nom nom. Lots of plum wine, soju and BBQ'd meat = happy belly (need to design an emoji for that). Wheelchair access: There is a step free entrance, but no accessible toilets.